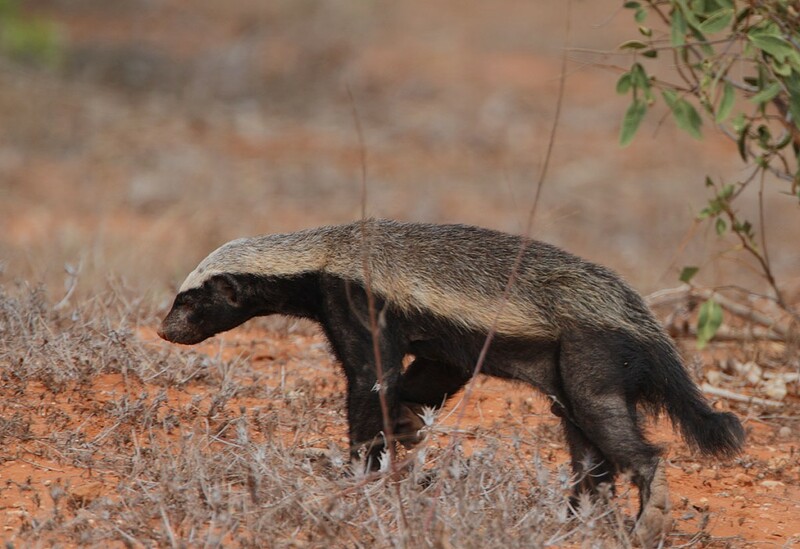 The Honey badger or ratel (Mellivora capensis), is a tenacious small carnivore that has a reputation for being Africa’s most fearless animal despite its small size. It is even listed as the “most fearless animal in the world” in the Guinness Book of Records. The honey badger has a fairly long body, but is distinctly thick-set and broad across the back. Its skin is remarkably loose, and allows it to turn and twist freely within it, an adaptation for fighting. The head is small and flat, with a short muzzle. The eyes are small, and the ears are little more than ridges on the skin, another possible adaptation to avoiding damage while fighting. They are solitary carnivores with males and females only getting together to mate. They do not form pairs and males play no part in raising the young. They do not have a fixed den but constantly move through their territory, often sleeping in a different hole each night. The cub develops slowly with its eyes only opening after two months. Honey badgers are nocturnal during summer and diurnal during cold winters. They often dig their own refuge holes but often use holes prepared by other carnivores like Jackal and Mongoose. They are generalist carnivores with an extremely wide diet. They eat a host of smaller food items like insect larvae, beetles, scorpions, lizards, rodents and birds. They will also catch large reptiles like leguaans and crocodiles and have no fear in catching highly venomous snakes. As suggested by both their common and scientific names (Mellivora capensis means “honey eater of the Cape”, badgers have always been associated with bees. Apart from man, they are the most destructive predator of honeybees in Africa and can do substantial damage to both traditional and commercial beekeepers. While honey is not a necessary part of their diet, the highly nutritious bee brood is a sought after delicacy and this brings them into conflict with beekeepers. The good news is that unlike many other farmer – carnivore conflicts there are cost effective solutions to this one and there is therefore no justification, whether economic or ethical reasons for badgers to be killed. Most beekeepers prefer to raise their hives on stands or trestles to keep them out of reach of the badgers. To ensure effective conservation it is crucial that more beekeepers adopt “badger friendly” methods as part of their profession, particularly when hives are placed in indigenous vegetation and borders of protected areas. This entry was posted in Eco awareness, Forest mammals, From the Phantom Forest and tagged Shy residents. Bookmark the permalink.